Salon won our eatinbrixton annual poll a couple of years ago and so on a slow night with nothing in the fridge and a lack of ingenuity we managed to get an early booking to try it again. See here and here for our previous reviews. We chose the set menu and the little appetiser and bread were definitely a hit. But we were a bit disappointed with some dishes. 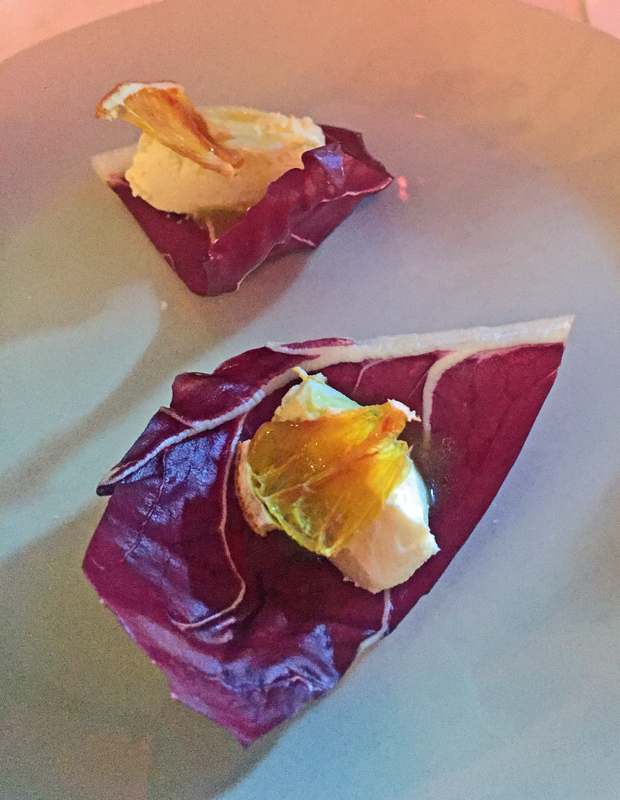 The orange, cheese wrapped in radicchio was a lovely way to start. it was sweet and soft and crunchy. This was followed by a cheesy something with broccoli which was salty, soft and crunchy so we are getting a bit of a theme here. 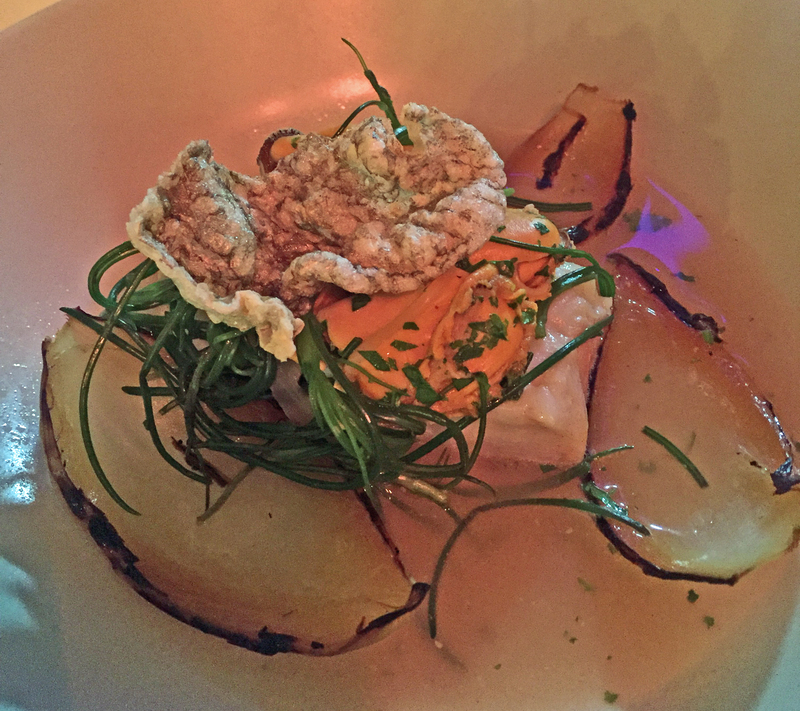 The cod came in a lovely broth that they should be proud of, but unfortunately the cod itself was too salty and the crunchy fish skin had stayed a little too long on the pass, so wasn’t really crunchy when it reached us – which was a great pity. 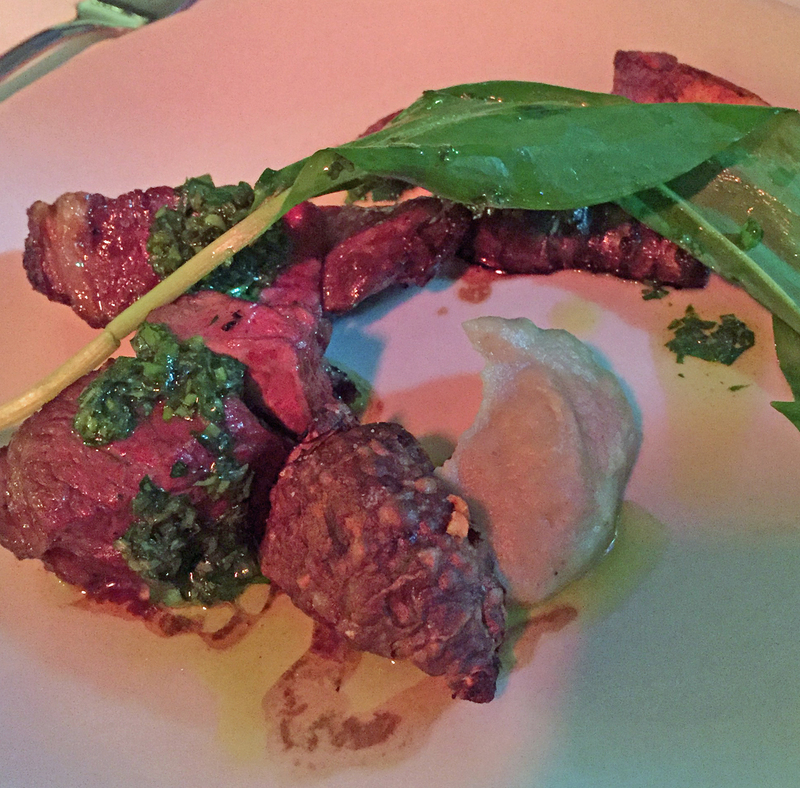 Next was a piece of lamb with Jerusalem artichoke. The artichoke puree was lovely and smooth but we had a split decision on the roasted artichoke as the skin was a bit tough – we recommend removing it. 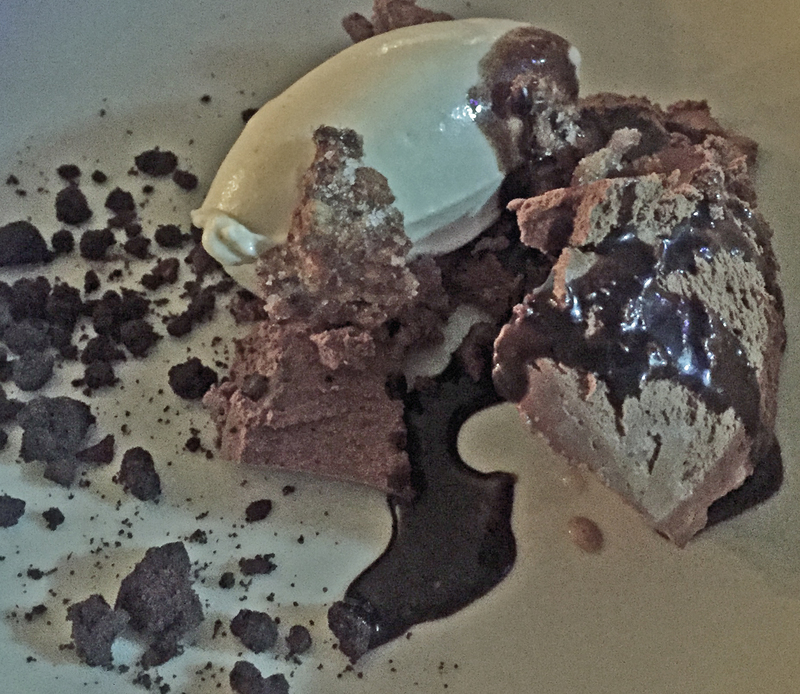 Finally we shared a chocolate mousse with beer ice cream and chocolate soil. We suspect as early customers that the mousse hadn’t left the fridge for long enough as it was pretty solid and we couldn’t taste any beer in the lovely light ice cream but we were both keen on the chocolate soil which did add a necessary crunch. So the food was mixed but what they do get right here is the mixture of texture with surprising flavour bursts. All this might sound a little picky but as it is more expensive than other restaurants in the area, it does need to deliver on everything, However, we would have given it two stars (if we ever gave any) and definitely want them to just keep on trying. We had a rhubarb fizz, which looks really pretty, and a rubarb sour to start. 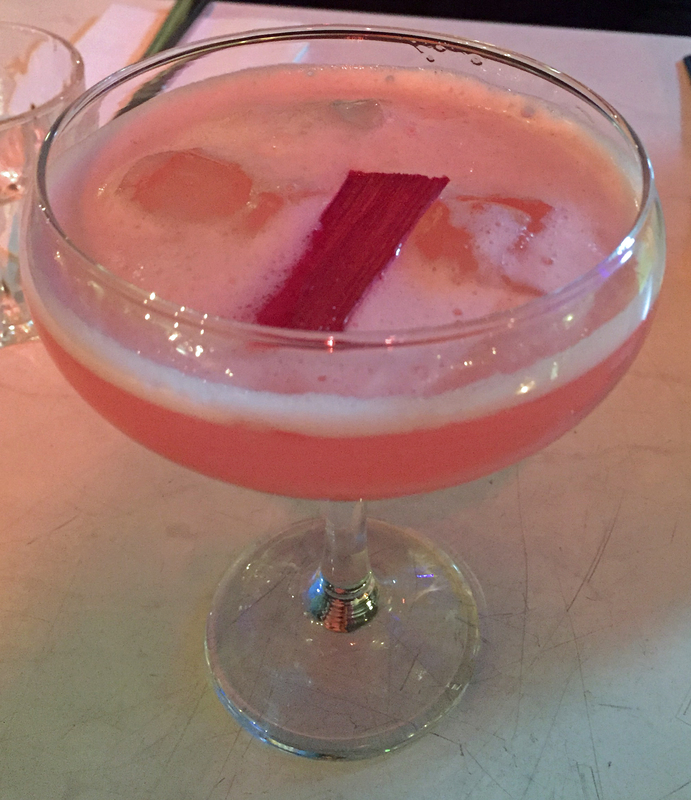 We recommend the sour – tastes much more of rhubarb. We also had one glass of house red wine and the bill came to .£90 including a tip (set menu £33 per person which we thought was good value).